It gives us great pleasure to announce that Desert Springs Resort has been selected to host this year’s season-ending Tour Championship of the PGA EuroPro Tour sponsored by Andalucía Tourism between Wednesday 30th October – Friday 1st November 2019. Offering direct access to the Challenge Tour through the final Order of Merit, PGA EuroPro Tour players will compete in 15 main events for more than £850,000 in prize money this season at some of the UK and Ireland’s premier golfing venues, including Frilford Heath, Mannings Heath and Tulfarris Hotel & Golf Resort. Only the top 60 golfers on the tour’s ‘Race To Desert Springs Resort Andalucía’ after the final event of the regular season at Newmachar Golf Club, Aberdeen qualify to play the Tour Championship which has a prize fund in excess of £100,000. The best players on Europe’s leading development tour will be competing to seal their place in the top five on the ‘Race To Desert Springs Resort Andalucía’ Order of Merit at the end of the event and earn themselves one of the five Challenge Tour cards available for 2020. The Tour Championship at Desert Springs will be filmed for a two-hour highlights package to air on Sky Sports in the UK in November, and on 98 networks around the world including Fox International across Asia, Fox Sports Australia, Fox Sports in Turkey, Greece, Malta and Cyprus and StarHub in Singapore, reaching over 400 million homes. “Desert Springs Resort is delighted to have been invited to be host to the Tour Championship for what will now be the fourth occasion in the last five years. Throughout those years the relationship between the Resort, its residents and members and the Europro Tour personnel and players has gone from strength to strength, to such an extent that the Tour Championships itself has now become a stable part of the Club’s calendar of events. 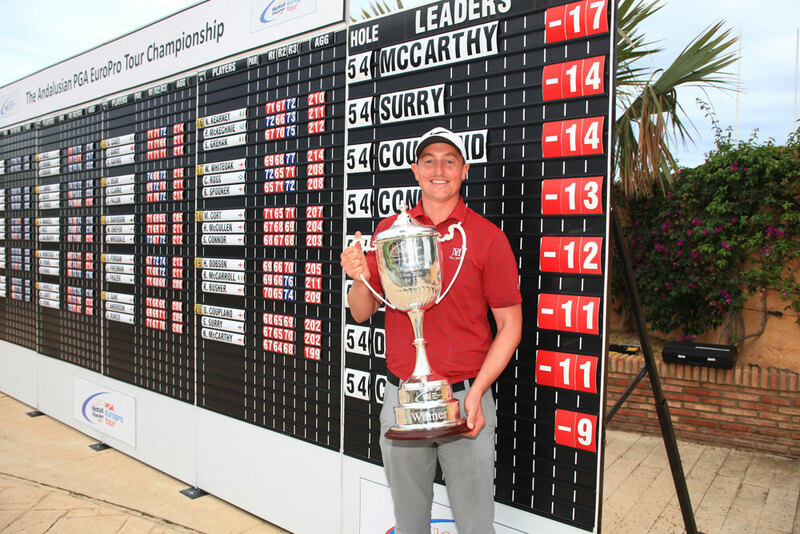 The PGA EuroPro Tour has played a vital part in the early careers of some of the biggest names in golf who have gone on to great success, paving the way for Ryder Cup Players, Major Winners and European Tour Winners. This is a fact that is still true and relevant of today’s generation of up and coming golfing stars! For Desert Springs Resort and the Indiana course to be part of the journey that the best players in Europe travel, is a factor of both benefit and prestige to all at the Resort. “I am absolutely delighted to be bringing the PGA EuroPro Tour back to Desert Springs in 2019. Simon Coaker and his team are the best in the business at running first class events and staging tournaments as high profile as the PGA EuroPro Tour Finals. Anthony and the Greens Staff are among the best in the world and show exceptional skill to give our players the very best tournament standard golf course we could ever ask for. Please see below the schedule for the 2019 PGA EuroPro Tour Championship. The Indiana course will be open for limited general play on Monday 28th October, with available tee times to be announced, once the final event itinerary has been agreed with the PGA Europro Tour.